We at St. Francis have formed a partnership with Fortuna Family Service Center (FFSC). Beginning with a generous donation from Tre Amici, a chamber music group that includes Mission Committee member Helen Winfrey who held a benefit concert in early 2018, St. Francis decided to partner with FFSC. We refer people who contact us looking for social services of many kinds to FFSC. That agency in turn either provides the needed services or refers people to county social service nonprofits, businesses and governmental agencies who can help. 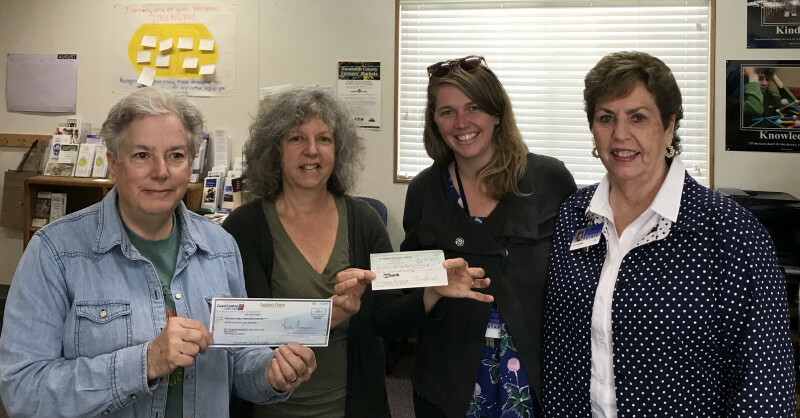 The photograph shows Priest-in-Charge Geri Cunningham and Deacon Mara Arack giving two checks totaling $1,000 to Aimee Dube and Kay Chapman, director and executive director, respectively, of FFSC. One check was from grant money from the Diocese of Northern California and the other was from the deacons discretionary fund. FFSC will use the funds to provide furniture for families moving into Section 8 (subsidized) housing and for enrichment activites such as music, art and swimming lessons for children.